FIRST Alum Rachel Clark was a founding member of Minnesota’s first all-girls FIRST Robotics Competition team, Team 2177 “The Robettes.” FIRST inspired her to change her career plans from psychology to engineering and gave her the practical experience, network, and self-confidence to help her get where she is today. As a FIRST Alum, she has returned to mentor the team while growing her engineering career at FIRST Strategic Partner 3M. “Even though I am a mentor now, I still learn at robotics and can apply what I am learning to my real-world job,” she says. I attended a small all-girls high school in St. Paul, Minnesota, that didn’t have any STEM-related extracurricular activities besides a math team. Until my junior year of high school, I was convinced I was going to be a psychologist. It wasn’t until one of our teachers spoke to the upper school during an assembly about this program called FIRST Robotics Competition that I ever gave engineering any thought. FIRST sounded like the coolest thing I had ever heard of, and I told that teacher that we just had to get a team started. That is how Team 2177, The Robettes, was born. We are the first all-girls team in Minnesota. Our first year as a team, without any other options, we ended up building our robot out of my family’s garage and made it to the semifinals as the alliance captain in the St. Louis Regional. Our second year as a team was my senior year; I was nominated captain and we made it to the finals at the Minnesota Regional. During my senior year I decided that I was only going to apply to engineering colleges, and I was going to become an electrical engineer. I never would have made that decision if it wasn’t for FIRST and The Robettes. I was accepted into all the engineering schools I applied to and decided on (FIRST Scholarship Provider) South Dakota School of Mines & Technology. In the electrical and computer engineering department at SDSM&T, there were only eight total women. This was a huge culture shock for me coming from an all-girls high school, and I was definitely out of my element. If I hadn’t participated in FIRST in high school, I probably would not have made it through engineering in college. Being on a FIRST team gave me practical hands-on engineering experience; but most importantly, it gave me confidence in my skills and in myself to not be afraid to ask questions, make mistakes, or stand up for myself. Tell us about your career plans and path. While in college, I had three internships and one co-op. I received an internship as a freshman with EchoStar in a large part due to my FIRST experience. I then proceeded to work for (FIRST Sponsors) John Deere, Johnson & Johnson, and 3M. At the end of my summer internship at 3M, I was offered a full-time position upon graduation; I got to return to college in the fall for my final year already employed. I worked for 3M in South Dakota for almost three years. In 2015, my husband and I moved back to Minnesota because I had a great job opportunity at 3M headquarters and I missed FIRST and The Robettes. How have you continued to be involved with FIRST as an Alum? I have been back mentoring The Robettes going on my fourth season. 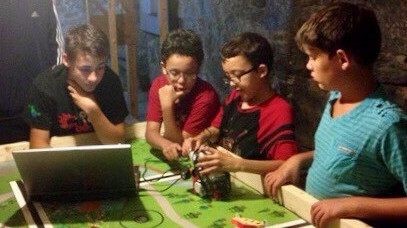 Even though I am a mentor now, I still learn at robotics and can apply what I am learning to my real-world job. I really enjoy giving back to the team that has given me so much and got me where I am today. In fact, The Robettes currently have five alumnae who have graduated from college and returned as a technical mentor to the same team that inspired them to pursue a career in STEM. 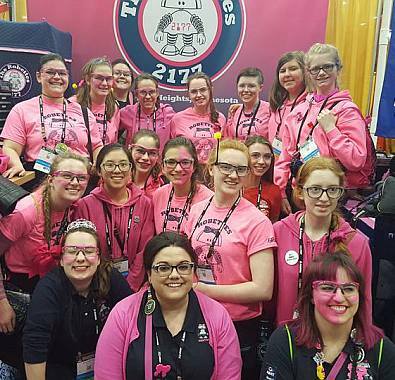 As there are not a lot of technical female mentors, our goal is to not only show the young women on our team but also on other teams what their FIRST experience can do for them and that there is a place for them in the STEM field.